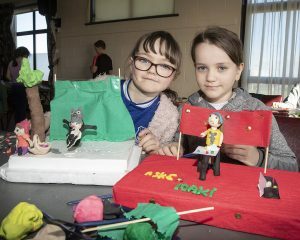 THE creative minds of Askea’s young people were unleashed at the local Community Games model-making competition. Twenty-six children with plasticine in hand concocted a variety of imaginative creations from scratch. They had three hours to complete their models and the results ranged from depictions of karate contests to a swimming meet. Before the event, Orla Brennan and Sinead Whelan held some classes to give the youngsters the basics. “They had to do something based on Community Games. With categories such as art and handwriting, Community Games is not just about sports. It gives children who have other interests something to do,” said Orla, who is secretary of Askea Community Games. “Community Games is about getting the children involved in their community,” added Orla. First, second and third place winners were awarded in the under-ten, 12 and 14 categories and they will contest the county finals in Kildavin on Sunday 24 February.